What does it takes to bring a convenient and easy way of life to modern Filipino homes these days? See the latest Samsung Flexi Home Deals for 2016 and start getting the latest innovation in home appliances at their flexible rates. When it comes to home appliances, modern Filipino households search for the perfect partners in taking care of their family. Samsung Philippines offers a suite of digital appliances that makes daily life more comfortable, convenient, and time-efficient for today’s millennial parents. With their innovative features, these appliances are designed to meet each family member’s unique lifestyle needs. What’s more? 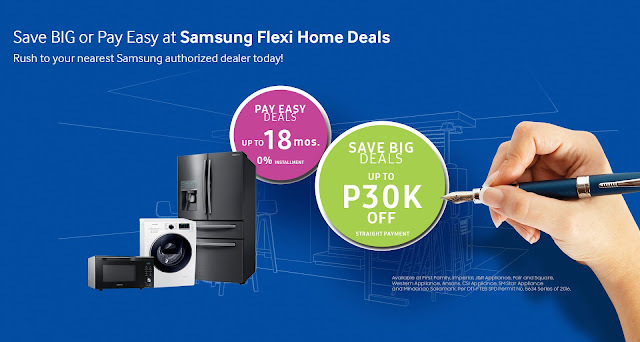 Samsung’s innovative products are now within reach of more customers with the Flexi Home Deals promo, which offers flexible payment packages for a limited time. The Flexi Home Deals cover a wide range of models of Samsung digital appliances - refrigerators, washing machines, and microwave ovens. Customers can choose to avail of Samsung digital appliances in payment options they are most comfortable with. They can enjoy discounts of up to Php30,000 on digital appliances for one-time cash payments. For those who opt for easy deals on installment, discounts are also available for payment periods of 6 months, 12 months, and 18 months at 0% interest. “Through the Flexi Home Deals, we are able to provide customers with the opportunity to decide how they want to avail of their dream home appliances. We want more Filipino families to experience the unparalleled convenience and comfort of using Samsung Digital Appliances. Through this, we can fulfill our mission to be the Filipino home’s perfect partner in taking care of the family,” said Stephanie Chua, Head of Product Marketing, Samsung Digital Appliances. The Flexi Home Deals promo runs from July 12 to September 30, 2016 at selected Samsung dealer stores nationwide.